Thousands of diaspora Tamils of all ages took part in the hunger strike protest demonstrations launched by Tamil youths in France, Germany, Denmark, Switzerland and Britain against the unceasing atrocious attacks by Sri Lanka armed forces on innocent Tamil civilians in Vanni. Similar protest demonstrations organized by Tamil Youths Organization (TYO) continue in many other countries in an effort to draw the attention of the International Community to the carnage of Tamils in Vanni that continues unchecked. Fast against genocide of Tamils in Sri Lanka in Ottawa. Immediately stop the genocide of Tamils by Sri Lanka state. Provide immediate humanitarian assistance to the people trapped in the ‘safe zone’. Stop Sri Lankan and Indian Army using chemical weapons on the Tamils in Vanni. Lift the ban on Liberation Tigers of Tamil Eelam. In Ottawa, one of the five diaspora Tamils continuing their hunger strike protest, Julius James, 34, has been admitted to Ottawa Civic Hospital. Kanapathipillai Thulasisigamony, 74, Vaiseegamagapathy Yogendran, 54, Pushparajamani Nallaratnam, 46 and Mahalingam Sivaneshwari, 59 are the four who continue the fast. In France, the protest demonstrations continued for the eighth day in which four Tamil youths continued their fast unto death for the fourth day taking only water. Selvakumar Alfred, 27, Anandakumaraswami Raviraj, 26, Vigneswaran Varunan, 23 and Shanmugarajah Navaneethan, 26 are the youths who continue their fast unto death. 13 Tamils including young men and women began a hunger strike in Tuesday from 2:00 p.m in front of Dusseldorf Parliament in Germany. 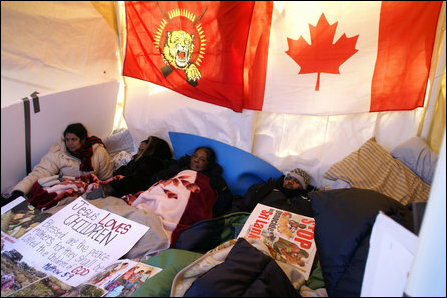 In Denmark four Tamil youths ended their hunger strike protest Tuesday. Sugunenthiran Markandu, 23, Shalini Parameswaran, 22, Prathap Sivapalasundaram, 23, Suganthini Thambirajah are the four youths engaged in the fast.